Q: Hi, I would like to purchase the css3menu, however I have tried the free demo, and I have issues with the menu dropping into 2 lines on smaller screens:the menu works ok for a PC (width fits the wowslider above it at 830 width), but when viewed on an Ipad, the wowslider adapts to the screen and gets smaller to fit width but the menu is displayed onto 2 lines. I tried the 'responsive' menu below but it doesn't seem to want to respond as the wowslider does, can you help? 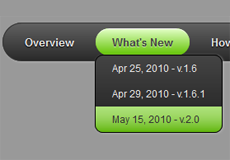 A: "Responsive" option was added in the latest version 3.1 of CSS3Menu. 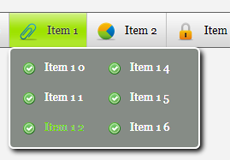 I just purchased CSS3 Menu 4. Hi, I've downloaded free version and inserted the menu into my page. It looks fine in all browsers except IE. I want to make some changes in my menu. Is it possible to remove a text shadow?